AutoCAD is one of the most popular applications for creating 2D and 3D design projects. Despite its benefits, you may have reason to uninstall or reinstall AutoCAD. To that end, we have created a full removal guide including two methods to correctly uninstall AutoCAD. Using either of these methods, you can remove all Autodesk products. 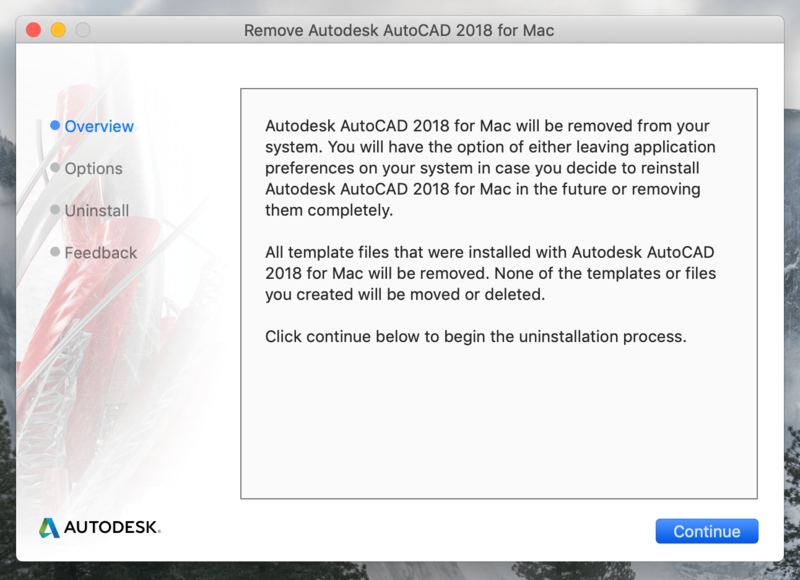 Uninstall AutoCAD using the Remove AutoCAD file. Uninstall AutoCAD using an Autodesk uninstallation tool. Once you install AutoCAD on your Mac, it creates the appropriate folder in your Applications folder. There you will find the Remove AutoCAD file. Launch this file and follow the provided steps by clicking the Continue button to uninstall AutoCAD on your Mac. If for some reason you can’t find this file on your Mac, use one of two other methods provided below to delete AutoCAD. To make a full uninstallation of AutoCAD, you need to remove both the app and all its associated service files. Removing the leftovers of deleted apps is an essential step you should always do to keep your Mac clean and prevent slow performance. Just imagine how many apps you install on your computer and then remove for different reasons. All of them create service files which take up a huge amount of space on your disk. If you don’t delete them, they just occupy useless space. So here are the steps to uninstall AutoCAD on your Mac. Additionally, you can use these steps to uninstall any Autodesk app or any other third-party program. First, remove the AutoCAD executable file from the Applications folder. Then find and remove the service files of AutoCAD which are stored in the Library folder. The Library folder is a hidden system folder where all service files are stored: cache, cookies, logs, preferences, support files, Internet plug-ins, launch agents and so on. To open the hidden Library folder open Finder → in the menu click Go → select Go to Folder… → in the search field paste ~/Library → click on Go. *Learn also other ways how to get the Library folder. Here in the Library, you should check the directories provided below to find and remove the service files associated with AutoCAD. 3. 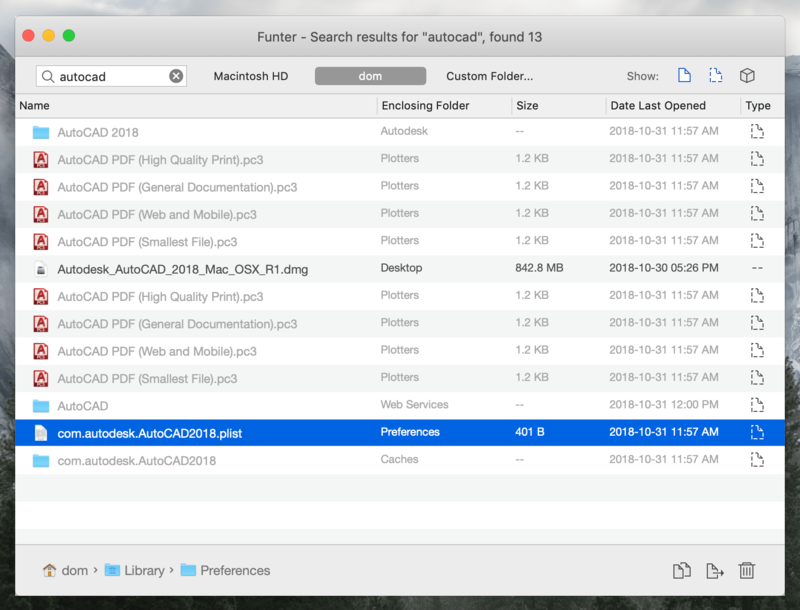 Next, In order not to miss any files, we recommend that you search for hidden support files using the free application from Nektony, Funter. Just type Autocad in the search field and click to find them. 4. And finally, after removing all the AutoCAD files, go to Trash and empty it. Now the work has been done. 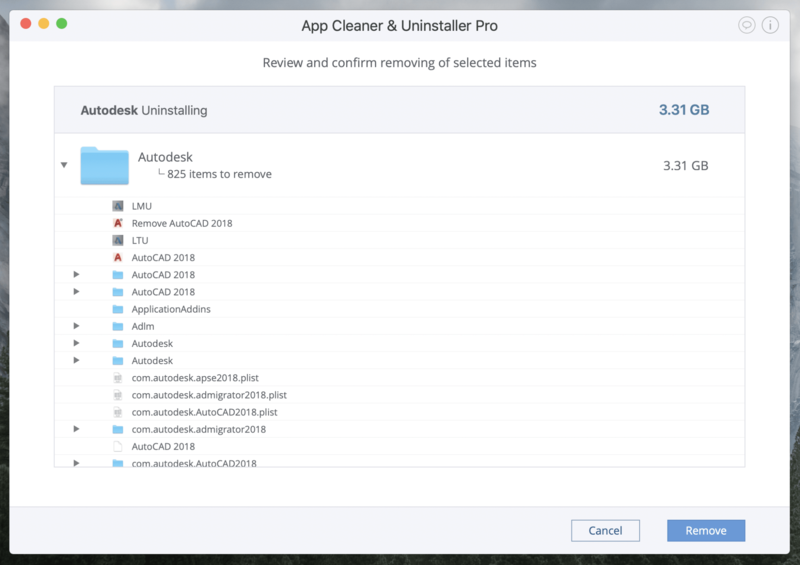 If you feel unsure about removing the service files or just would like to find an easier and safer solution for uninstalling apps on your Mac, we recommend using the AutoCAD remover, App Cleaner & Uninstaller. Read on to learn how to uninstall apps on a Mac completely, with just a few clicks. With the first app uninstallation method, you need to manually find all the leftover files, which may be scattered throughout your disk. However, App Cleaner & Uninstaller finds all of them automatically. No longer do you need to waste your time and risk deleting important files, which are necessary for your system to function properly. Just watch the video to see how it is easy to uninstall AutoCAD with App Cleaner or follow the steps below the video. Get started with the app and wait until it finishes scanning your Applications folder. In the list of apps, select the Autodesk folder. In the right section, you will see all its service files. 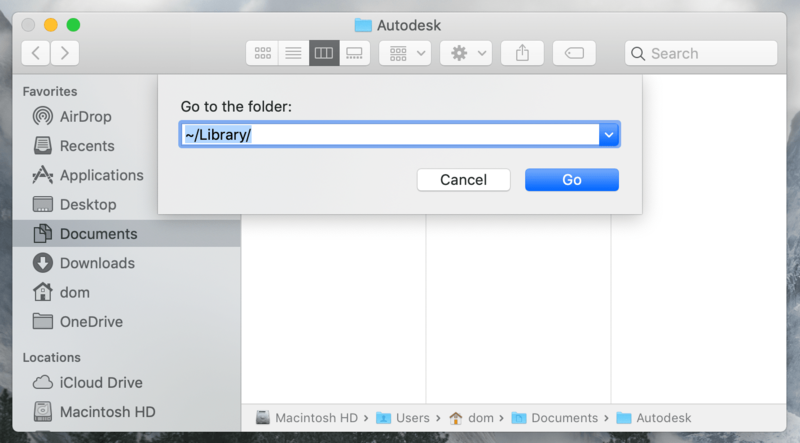 *Note: if you have other Autodesk products installed on your Mac, then only select the AutoCAD file in this folder. 4. Then just click the Uninstall button and confirm the removal. That’s all! Easy, quickly and safely! Enjoy using App Cleaner & Uninstaller for peace of mind that your Mac is free of unnecessary files. Not only does it find and remove leftover files of the current app, but also of previously-removed apps. 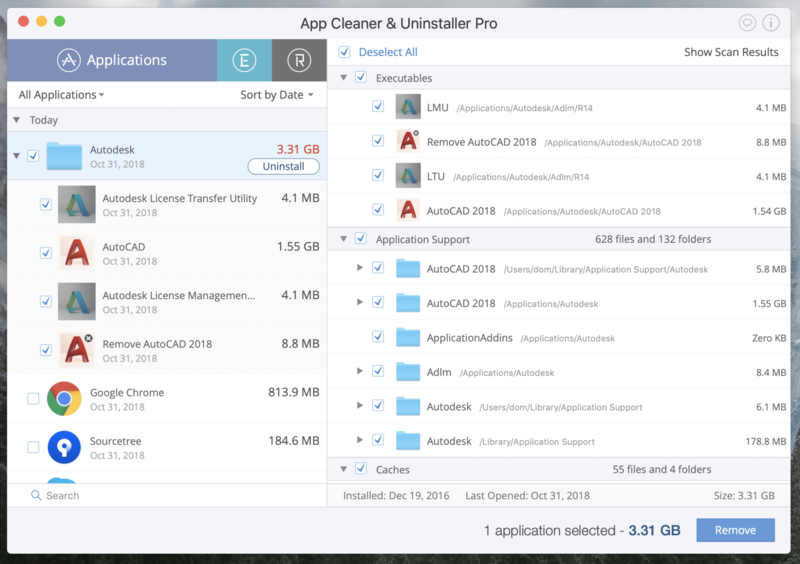 Learn more about App Cleaner & Uninstaller.